A world-class trombonist who has played for symphonies, operas and stages around the world will join an internationally recognized pianist for a free public concert Tuesday, Feb. 12, at MTSU’s School of Music. 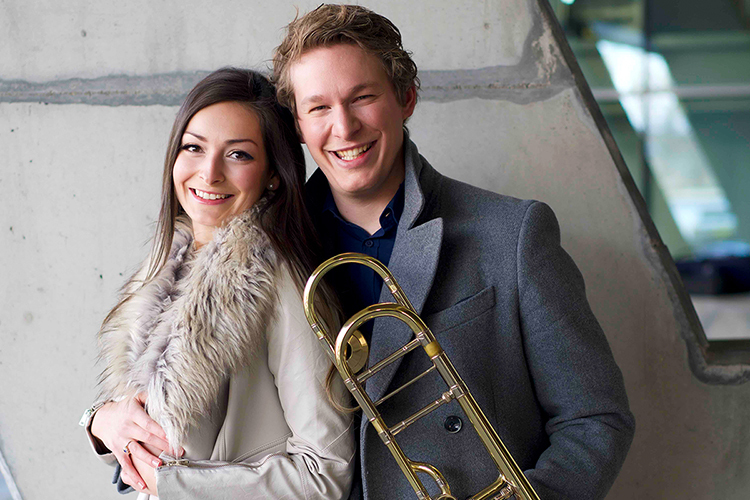 “Duo Steiner-Hochwartner,” comprising trombonist Peter Steiner and pianist Constanze Hochwartner, will perform at 6 p.m. Feb. 12 in Hinton Hall inside the Wright Music Building. A campus map is available at http://tinyurl.com/MTParkingMap. Their performance will feature a diverse program of classical, Broadway and movie tunes, including Mozart’s “Rondo Alla Turca”; Leonard Bernstein’s “Somewhere” from “West Side Story”; “Arrows of Time” by Richard Peaslee; Puccini’s “Che gelida manina” from “La Bohème”; Bizet’s “Carmen Fantasy” for trombone and piano; “Fantasia Concertante” by Ricardo Mollá Albero; “Parla piú piano,” or the theme from “The Godfather,” by Nino Rota; “Sonata in G minor” by Henry Eccles; Gabriel Faure’s “Fantaisie for Flute and Piano,” “Romance en la majeur” and “Elegy”; and “Trio for Flute, Violoncello, and Piano” by Bohuslav Martinu. Steiner, a native of Italy, was principal trombonist with the Colorado Symphony for the 2014-15 season, when he was only 21, and followed that appointment two years later as trombonist of the Vienna State Opera and Vienna Philharmonic. His current schedule includes more than 100 performances, including solo concerts and a three-month world tour with Hochwartner. Hochwartner, a native of Austria, also has performed around the globe, presenting organ concerts in Europe, the United States and South America. She took her first piano lessons at age 3 and was accepted into a class for gifted students at the University of Music and Performing Arts in Graz, Austria, then changed her focus to the organ after high school. The musicians began collaborating in 2017 as Duo Steiner-Hochwartner and already have performed more than 80 concerts in universities and concert halls around the world. Their current world tour includes stops in South America, Asia, Europe and the United States and Japan. Hochwartner’s debut album, “Sapphire,” on which she collaborates again with Steiner, is scheduled for release later this year. You can enjoy a preview of their performance above. For details on other School of Music events, call 615-898-2493 or visit the “Concert Calendar” link.